Zsa Zsa, an English Bulldog owned by Megan Brainard, stands onstage after being announced the winner of the World's Ugliest Dog Contest at the Sonoma-Marin Fair in Petaluma, Calif., Saturday, June 23, 2018. 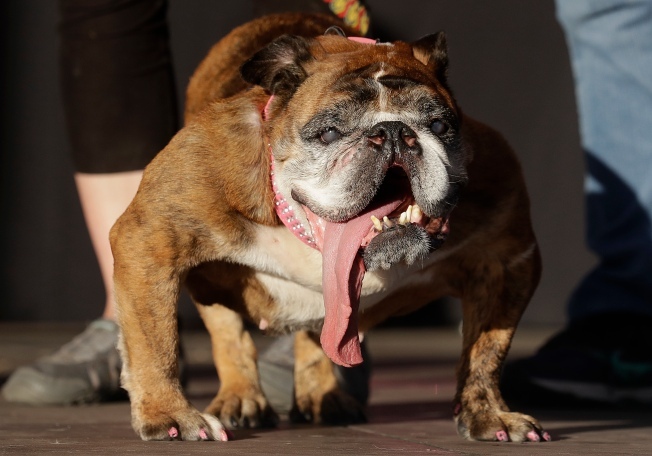 A 9-year-old English bulldog was named the winner of the 2018 World's Ugliest Dog contest in the San Francisco Bay Area. Zsa Zsa won the title Saturday night at the Sonoma-Marin Fairgrounds in Petaluma. The dog's owner Megan Brainard of Anoka, Minnesota, will receive $1,500 for Zsa Zsa's win. Brainard found Zsa Zsa on a pet-finding site, according to the contest bio. Dogs in the annual competition flaunt their imperfections — some have hairless bodies, others have lolling tongues. The dogs and their handlers walk down a red carpet. The dogs are evaluated by a panel of judges.